My name is Frank. I would like to say a big thank you to all of you, the people and the organisation that in different ways helped me. Thanks to you, I have been able to complete a university degree which will create more opportunities for me and my family. After finishing secondary school, I had no prospects of going to university due to my family’s precarious financial situation. I was really keen to gain a professional qualification at university but because my family did not have the money to pay the university fees, that was not an option. 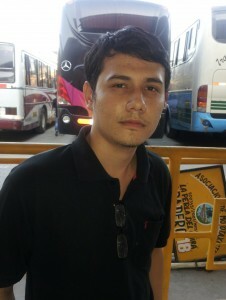 While I was exploring my options, I came across some people in Piura who put me in touch with TIC. I was offered financial support that allowed me attend University. My family was so happy! Had it not been for the support of these noble people – TIC – I would have not been able to finish university. I would have probably had to abandon any hope of gaining a professional qualification. Fortunately, I have now successfully completed my university studies and gained a degree in engineering. I hope to continue improving and achieving more challenging goals. My family and I would like to express our deepest gratitude for the help you have given me. I am convinced that I have a brighter future thanks to you and that I’ll be able to support my family, who have always been there supporting me. The convergence of goodwill from people like you, and the desire to succeed on our side have made this possible. I wish TIC a very successful future and hope many children’s and young people’s future prospects get brighter thanks to your support.